One of the lovely Spring flowers which bloom in our foothills is the spiderwort. 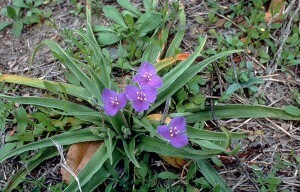 Spiderworts form the genus Tradescantia. The flowers of various species of Tradescantia can be pink, white, or purplish. Our spiderwort (Tradescantia occidentalis) blooms from mid-May through June and into July. The flowers grow in clusters and are a purplish blue. Each flower is about an inch across and has three petals. To some, the name spiderwort seems strange or whimsical. “wort” comes from an Old English word “wyrt” which simply means plant, herb, or root. Spiders don’t seem to have any special affinity to spiderwort. So, perhaps “spider” refers to the shape of the plant, as it does for the spider plant which grows in many of our homes. It is easy to imagine the cluster of spiderwort flowers as the body of a spider with the grass-like leaves as the legs. One species of spiderwort has found a very unusual scientific application … as a radiation monitor. The stamen hairs of this spiderwort are each a chain of single cells, like beads on a sting. The stamen hairs grow by the successive addition of cells to the chain. In this particular species, the cells of the stamen hairs are usually pink. But, there is an occasional blue cell. The blue color is the result of a single point mutation in the cell’s genetic material. The likelihood of this mutation occurring is proportional to the radiation to which the cell is exposed. So, counting the number of blue cells in the stamen hairs gives an estimate of the radiation to which the flowers were exposed. Since the cells in each hair grow sequentially, the location along the stamen hairs of the blue cells tells when the radiation exposure occurred. This species of spiderwort was once planted around a nuclear power plant in Japan to monitor the release of radioactive material from the nuclear plant. Not only did the spiderworts tell how much radioactive material was released and when, they also told how the wind dispersed the radioactive material.